Their unique blue feathers are what really distinguish them from other breeds. The feathers are an almost grey blue laced with streams of dark blue throughout every feather. 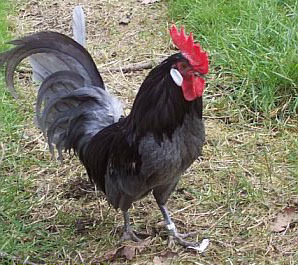 Andalusian chickens are odd because not all of their hatchlings have blue feathers only around fifty percent will be blue. Some of the chicks will have white feathers and others will have black feathers. However they all carry the blue gene and can produce the blue feathered variety easily. Their skin is a plain white color and they have a large single comb. Andalusians have a robust nature that makes winters fairly painless. They are natural backyard chickens, love to wander, forage, and are not usually broody. They will fly over fences when they can to explore. Andalusians lay a lot of large white eggs as many as 160 a year, and they even lay eggs throughout the winter and fall.